TORQUATO TASSO was born in Sorrento in 1544 while his father Bernardo was campaigning in Piedmont with his patron, the prince of Sanseverino. Bernardo was in fact repeatedly absent during Torquato’s early childhood. In 1547 Viceroy Pedro da Toledo attempted to introduce the Inquisition in Naples, provoking a violent uprising. Representing the insurgents, Sanseverino, accompanied by his secretary, Bernardo, traveled to Augsburg to confer with Emperor Charles V. In 1548, Bernardo returned to Salerno and in November 1551 the Tasso family moved to Naples. But in 1552, Sanseverino with his retinue were proclaimed traitors, and all their property was confiscated. Nonetheless they continued to intrigue for a military invasion of Naples against the Spanish — Tasso at Henry II’s court in Paris and Sanseverino at Suleiman the Great’s in Istanbul. These efforts failed, and Bernardo moved to Rome, barred from his family by the decree of exile. Meanwhile Torquato had begun his schooling at a Neapolitan convent under the Jesuit Giovanni d’Angeluzzo until summoned to Urbino by his father who, though impoverished and a fugitive, was well connected. Torquato continued his education at Urbino under the best humanist masters, with the ducal heir, Francesco Maria, as one of his schoolmates. In 1559 he began composing his chivalrous epic Rinaldo. 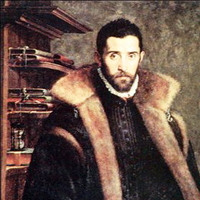 In 1561 Tasso gave up law school at Padua and began his studies in philosophy and rhetoric at the university of Bologna. From 1565 Torquato served as court poet to the d’Este family in Ferrara, often traveling with various members of the family on official business. During these years Tasso began to publish love poetry, including his Love Poems for Lucrezia Bendidio the Discorsi dell’arte poetica, dramas including the pastoral play Aminta, and his Gerusalemme liberata, the famed epic poem of the First Crusade. By the 1570s Tasso was moving frequently between princely courts in Ferrara, Mantua, Urbino and Turin, with a mysterious side trip back to Sorrento to visit his sister. In 1579 he returned to Ferrara where his increasingly erratic behavior led when Duke Alphonso II to confine him for seven years in Sant’Anna Hospital. In 1587 he was released into the custody of the Gonzagas of Mantua. He spent the remainder of his life wandering through Italy, much admired but impoverished. Tasso’s late travels included a stay in Naples, where he met his future biographer Giovan Battista Manso and the composer Carlo Gesualdo. Torquato Tasso died in Rome in 1595 at the monastery of Sant’Onofrio on the Gianicolo, just before Pope Clement VIII was to name him poet laureate.